The World card being pulled from my Black Ibis deck as we come to the end of the year seems fitting. This card represents, among other things, completion of a cycle. It could be most anything. You’ve seen a major goal full circle from start to completion. It can also be most literal and pertain to getting out there in the world. 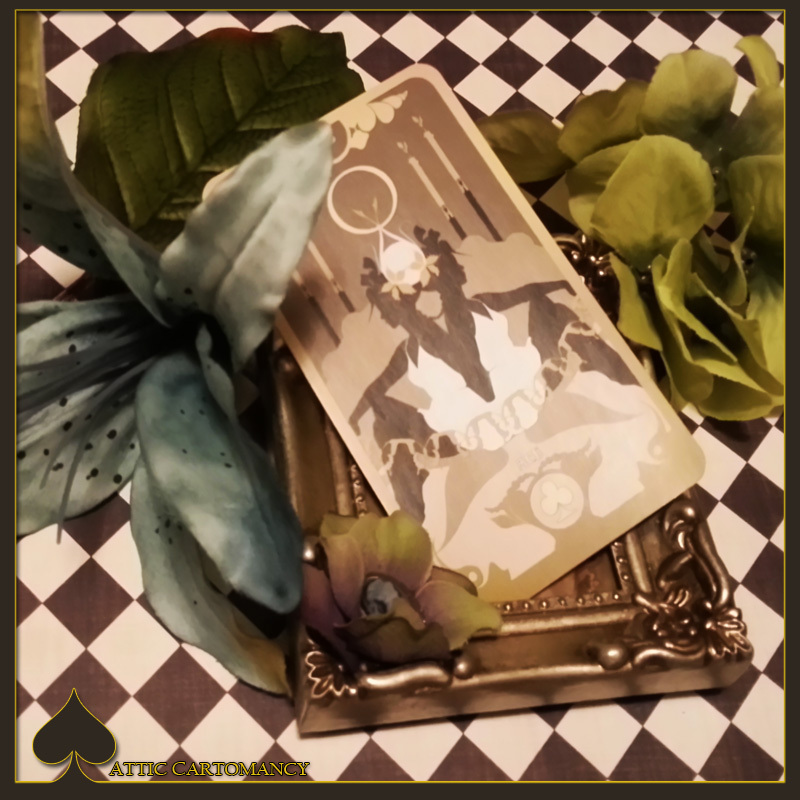 The Black Ibis tarot’s World card is one of the designs I didn’t stick with the traditional Rider-Waite-Smith style much of the other major arcana cards have in this deck. I choose to represent the worldly suggestions of this card a bit more literally. My card gal is a worldly traveler who has seen a thing or two. There is a world map behind her outlining her path to enlightenment. She understands things from a larger world view and her eyes express this. A top her head she wears a wreath (as oppose to the one traditionally surrounding her body) to suggest her crowning achievements. 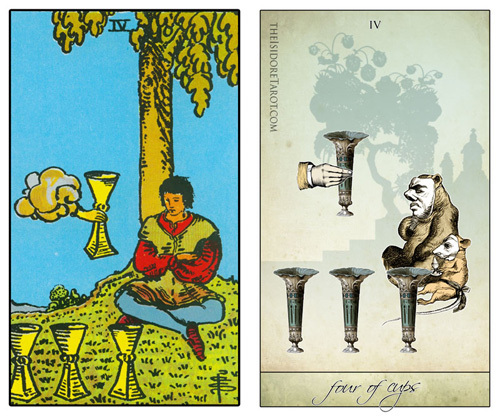 The Isidore Tarot is my take on the classic Rider Waite Smith deck using J.J. Grandville illustrations to recreate the original scenes and symbolism. These are side by side samples to show details. 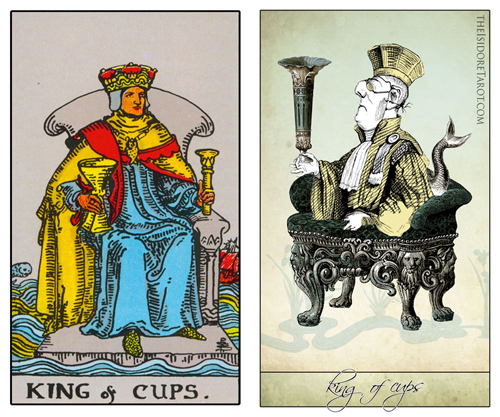 Today’s cards are the Page and King of Cups. As it continues to snow and snow some more, I’m officially looking towards spring. This is from a few springs ago with the original Isidore Tarot cards, when they were still square. I need me some spring mermaids! It’s not a quiet Sunday. Today is shoppe inventory day. Tins, boxes, drawstring bags, flower petals, labels, books, and on and on, it all needs to be counted and compared to my stock sheets and make sure all my inventory is on hand as it is in paper. Then the shoppe’s website needs a good cleaning to make sure everything is up to date. It’s all busywork really, to help keep my mind off of tomorrow. It seems appropriate to draw the strength card. The strength card is pretty much self explanatory. This card represents inner strength and using that strength to overcome what life throws at you. Not only overcoming these things, but doing so with maturity and thoughtfulness. That’s not always an easy task, especially when there is fear involved. Fear is an annoying beast. Fear has that need to undermine your strength. I’m tangoing with fear today. I meet my new doctor tomorrow and it took a lot to admit to my gent that I’m quite afraid of the approaching morning. This is a conversation that happened after hours of fluttering around the house without pause. Anxiety has a way of doing that to me. He tells me I just need to be strong and remember what will happen is what will happen and that I’ve weathered through far worse things. Then he tells me to take a breath. To exhale. So as I sit here taking that breather, I’m staring at this card and thinking about that. Life is not an easy creature to master, but there are ways to make it a smoother process. Believing you have the strength to take on and battle through anything that life tosses at you ultimately helps make it smoother because it helps keep that fear in check. So I’m going to meditate on that a bit before I start fluttering about again. Oh! A side note. I love taking my card photos. In this one I have my little zebra succulent newborns. I call them the twins. I love plants and am learning how to force my green thumb to get green. I’ve found I’m particularly good nurturing succulents. They’re very just let me do my own thing and I’ll be fine. Perfect! I was quite excited to see these little guys (along with their brother Eric, potted on his own as he’s way bigger) growing. Little things do make me happy. 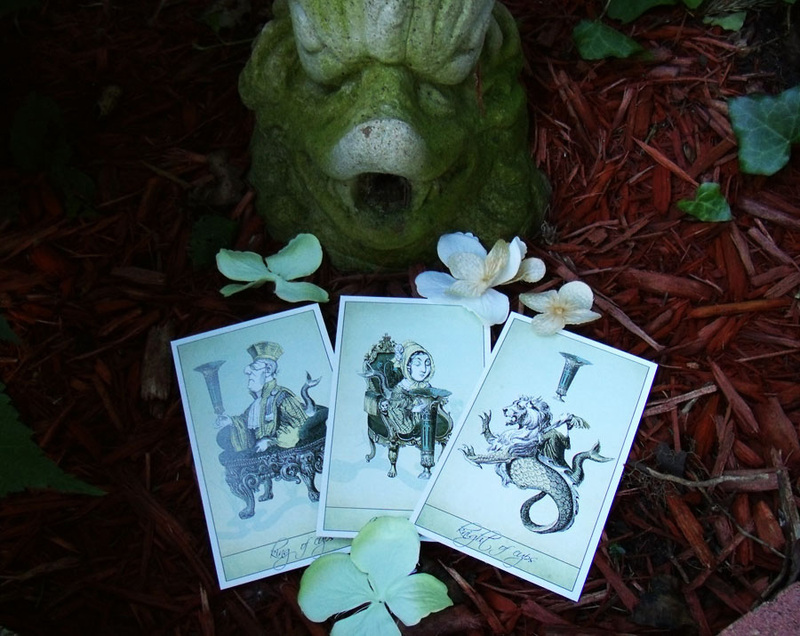 The Isidore Tarot is my take on the classic Rider Waite Smith deck using J.J. Grandville illustrations to recreate the original scenes and symbolism. These are side by side samples to show details. 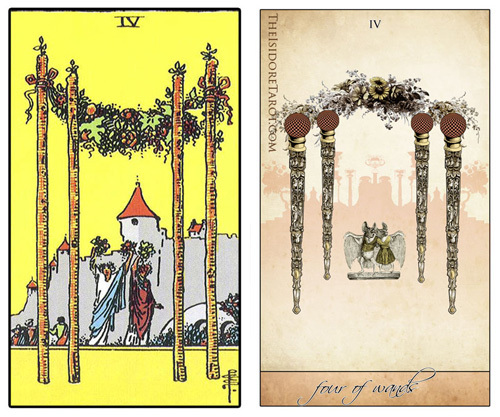 Today’s cards are the four and six of wands. Today’s card is the Queen of Swords. Traditionally this is a no nonsense lady who is all about independence, intellect and using logic and common sense to make a decision. You don’t get anything by this woman and she certainly doesn’t mince words. You won’t be able to appeal to her empathy either. Emotions are set to the side when this lady is figuring something out or dealing with someone. You could say this is a card that asks you to tackle your question in a mature and thoughtful manner where you don’t let your emotions cloud your judgement. Sometimes you have to be honest with yourself. 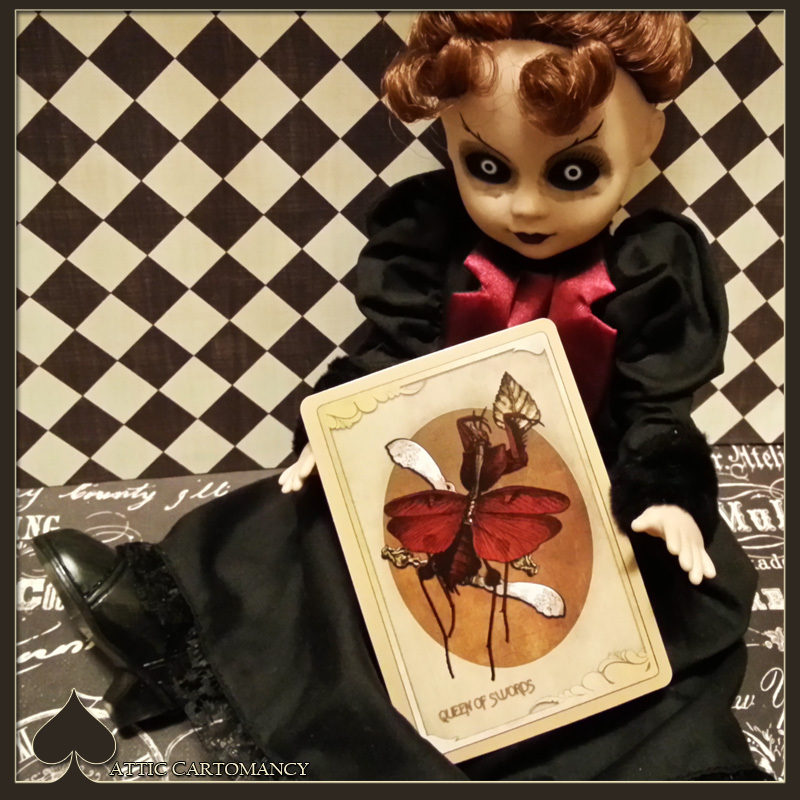 The card featured here (modeled by the–eh hem–lovely Lizzy Borden doll) is from my Black Ibis tarot. I have a great love of insects, especially Praying Mantis. 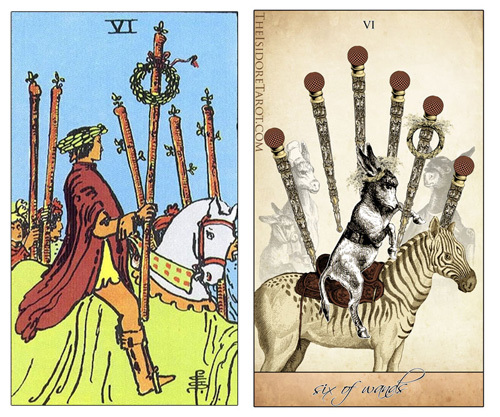 In matching insects to the symbolism I wanted (I stayed a bit more traditional with the major arcana and then strayed off the path for its minor arcana) a creature that was strong, pretty no nonsense, and one that didn’t let emotions get in the way. I know, I know, the lady mantis really doesn’t let emotions get in the way and she might represent an extreme. I just found her to be very powerful and liked her for the card. 🙂 She offers wonderful advice though and asks that you approach your pondering from her view point. 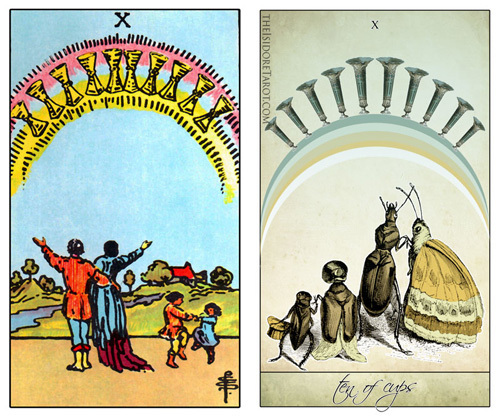 The Isidore Tarot is my take on the classic Rider Waite Smith deck using J.J. Grandville illustrations to recreate the original scenes and symbolism. These are side by side samples to show details. 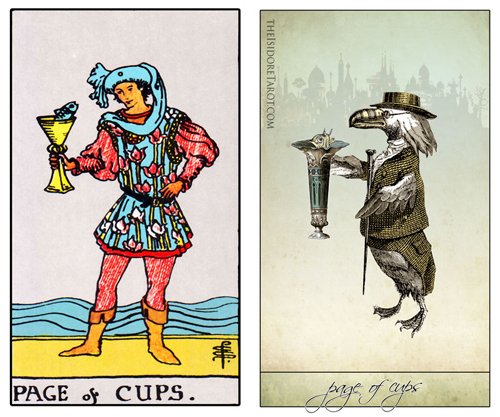 Today’s cards are the three and ten of cups. It might have become noticeable that most of my card of the day posts are written in regards to myself. I also like to change up decks so I’m learning more about each deck card by card. 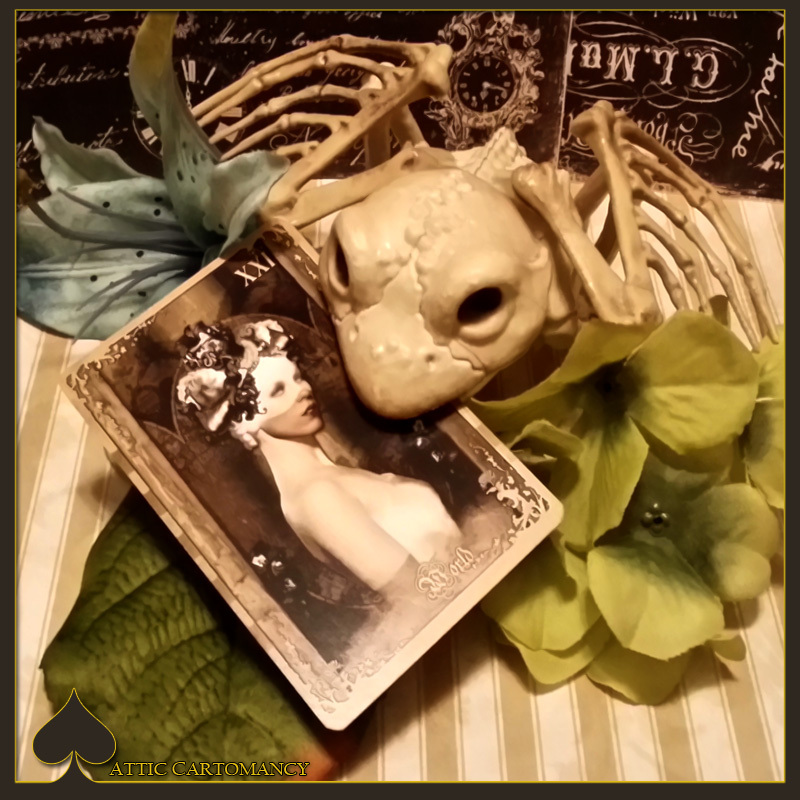 I have come to find that with the Lenormand doing a one card reading isn’t always practical as the meaning of the card has a lot to do with the surrounding cards. So instead I just use that card to learn a bit more about it and what question it might suggest I ask myself. 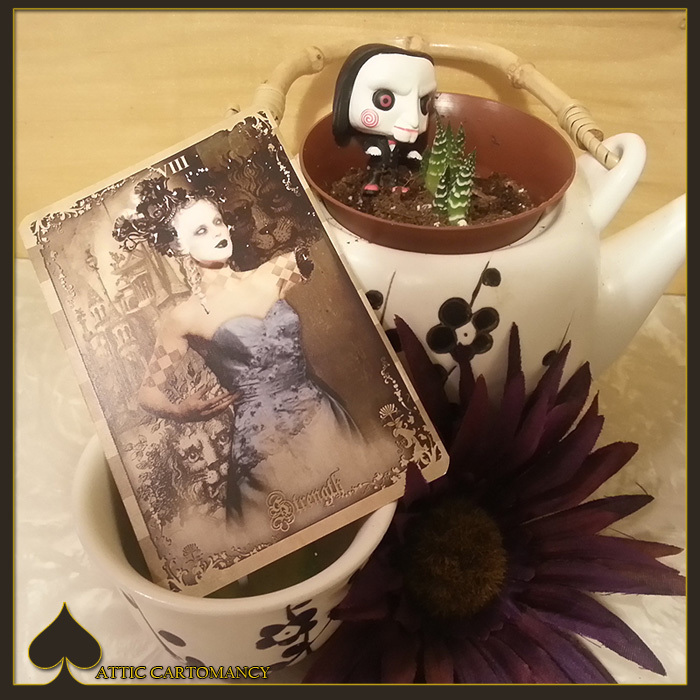 Today I drew the Lenormand deck’s Ring card and this one is from my Butterfly Circus deck. I used my conjoined twins in the artwork with the ring represented in their headdress. One of the meanings behind this card is being in a committed relationship. These gals don’t get much more committed than being joined at the hip. 😉 The card suggests you ask: If you’re in a relationship is the commitment between the two of you equal? If you’re single perhaps there is someone about to come into your life. This card also can represent going in circles or repeating a cycle. Maybe you’re stuck at a place you don’t want to be in and you need to find a way to pull yourself out of the repetition of that place. So in pulling this card by itself I might ask myself: Is my creature of habit ways getting a bit too creature of habit? How do I feel about that?